APRIL SOLD OUT! BOOK NOW FOR MAY 2019! Internationally renowned hair transplant surgeon, Dr. Alam has sold out April 2019 and has extended his sale into May 2019. *Pay your deposit in March to take advantage of the sale price in MAY. Surgery must be in May. HTA won’t be beaten on price! Ordinarily, a two-day procedure – get the best results in the shortest timeframe. No other clinics in Australia offer the same amount of grafts to their patients in a single day (if at all). 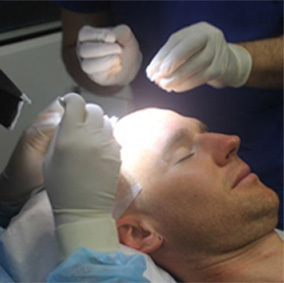 FUE is the careful craft of first extracting hair, one by one, and transplanting them to the sites where hair is needed. Dr Alam is the only FUE Surgeon in Australia, to complete a 6000 Hair Transplant in 1 day. This gives the patient the opportunity to achieve maximum coverage in 1 day. Regain your hairline, permanently & safely.